Swansea Council is the data controller for the personal information you provide on this website. Your information will be used to provide you with the service that you have requested and will not be used for any other purpose. We will not share your data with any third parties without your explicit consent unless we are required or permitted to do so by law. You can withdraw your consent at any time and ask for your personal data to be erased from our records. View information about the cookies this site uses here. www.dylanthomas.com is owned and managed by the Cultural Services team within the City & County of Swansea. 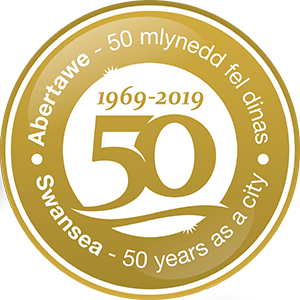 The Cultural Services Team is the provider of event and venue information for Swansea Council led entertainment venues and events. The source of all personal data that we hold is the information provided by you when you opt in to receive information. Data protection law describes the legal basis for our processing your data as consent. We use the Mailchimp email system to keep you informed of events, special offers or activities which may interest you. This personal data is collected only where you provide your consent that you wish to be kept informed about visiting the area. In order to do this we collect your email address, and if you wish to provide it, your name and the type of information you would like to get by email. Using data gathered from dylanthomas.com, targeted audiences for advertising may be created on third party platforms including (but not limited to) Facebook, Twitter and Google. We measure activities based on the number of actions taken and do not make any attempt to use personally identifiable data to determine the actions of individual people. We keep your data for a maximum of 24 months or until you choose to unsubscribe from receiving our marketing material. If you have opted in to receive emails, we will contact you at intervals to provide you with information and news about events and activities taking place at the Centre. You can choose to withdraw your consent at any time, by changing your preferences or unsubscribing on any of the emails we may send, by contacting us or by clicking the link below. Your information is stored securely by Swansea Council for the purposes described above. You have the right to request that we provide you with a full copy of any personal information we hold on you, which we are obliged to provide to you within one calendar month free of charge. Where you believe the personal information we hold is inaccurate, for example where your contact details have changed, you have the right to demand the immediate rectification of any inaccurate data we hold on you. Where you believe we are holding your personal information beyond the period of retention, you have the right to demand its immediate deletion. You also have the right to demand that we completely erase within a reasonable time frame all the personal data we hold about you.